The composition of Le Roi David came about in rather an unusual way, as is related in Mathieu Fercy’s useful notes. In 1921 the Swiss poet, René Morax (1873-1963) devised a drama incorporating music, dialogue and dance on the subject of the life of King David. This was to be performed at the Théâtre du Jourat near Lausanne. On the recommendation of Ernest Ansermet and Stravinsky, Morax asked Honegger to compose the music, a task he had to accomplish in some haste. What I didn’t know until reading these notes was that the reason that Honegger was put under so much time pressure was because Morax turned to him at short notice after his original choice, another Swiss composer, Jean Dupérier (1886-1976) turned him down. (Dupérier, I confess, is a composer of whom I’ve never even heard.) Honegger completed the task in just two months, finishing towards the end of April 1921. There were other constraints besides a shortage of time. For one thing the chorus was composed of amateur singers and so, I presume, their music had to be tailored to their capabilities. Furthermore, the instrumental forces at Honegger’s disposal were not exactly lavish. He wrote for the forces available to him, namely 2 flutes, oboe, 2 clarinets, bassoon, horn, 2 trumpets, trombone, timpani, percussion (one player), piano, harmonium, celeste and double bass. Within these limited forces there was also some doubling of instruments by the woodwind players. I was amused to read the response that Stravinsky gave when Honegger turned to him for advice: “It’s very simple. 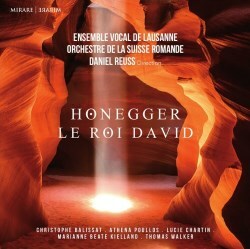 Behave as if you had actually wanted this ensemble, and compose for a hundred singers and seventeen instrumentalists.” It seems to me that Honegger pretty much followed this advice and it is one of the triumphs of Le Roi David that the instrumental scoring sounds so ‘right’. In particular, there’s a primitive air to much of the wind and brass writing that is evocative of what we may imagine music might have sounded like in Old Testament times. The Morax production was duly staged – lasting an astonishing four hours, we are told – and Honegger’s music was widely acclaimed. For a 1923 concert performance Honegger revised the score, linking the musical numbers with a spoken narration. That’s the version which Daniel Reuss has chosen to record though Honegger later expanded the scoring for a larger orchestra including, I believe, double woodwind, four horns and a full string section. The work is divided into three parts. Part I deals with David’s early life from his selection and anointing by Samuel, the victory over Goliath – surprisingly no more than hinted at – the breach with Saul leading to David’s alliance with the Philistines and the death of Saul and Jonathan at the hands of the Philistines. This part of the work includes the extraordinary episode of the incantation of ‘la pythonisse’ (the Witch of Endor). Part II, the shortest, mainly concerns the Dance before the Ark. In Part III David’s illicit love for Bathsheba, their punishment by God and repentance are covered before David, as his death approaches, sees Solomon crowned as his successor. I first got to know Le Roi David through Ernest Ansermet’s LP version made in the 1950s. That’s long gone – foolishly – from my collection though I see it’s available on CD as an Australian Eloquence issue (ELQ4802316). The two recordings I own are those by Charles Dutoit (review) and by Serge Baudo (Supraphon 11 0132-2). The Baudo is one of the fine series of recordings of music by Honegger and others that he made with the Czech Philharmonic for Supraphon. Both of these recordings are excellent though neither is strictly comparable with this newcomer. Baudo opts for Honegger’s full orchestral version. Dutoit uses the original instrumentation but, by the sounds of it, uses a much larger choir than Daniel Reuss – perhaps taking literally Stravinsky’s dictum. There’s also a crucial acoustic difference between those two older recordings and the Reuss. The newcomer was made in a studio – you can tell that just by listening but it’s confirmed by a session photo in the booklet. The other two conductors recorded the work in larger venues, probably on account of the forces they deployed. Dutoit’s 1971 recording comes from the Église Notre-Dame du Liban, Paris while the venue for Baudo’s 1985 version was the Dvořák Hall of the House of Artists, Prague. There are gains and losses from the different acoustics. The Reuss has the considerable virtue of clarity and immediacy, no bad thing in this music. He uses small forces; not only is his instrumental ensemble small but so, too, is his choir (8/9/9/10). Thus all the details of Honegger’s piquant scoring come through vividly but there’s no want of atmosphere in key passages such as the Dance before the Ark or the wonderful closing ensemble which depicts the death of David. The snag, though, is that the narrator is closely recorded. Because Baudo and Dutoit were recorded in large venues their respective narrators are clearly placed within the acoustics of those places and whilst there’s no lack of clarity in either case you hear the words spoken with the resonance of the building around their words. I like that very much. By contrast Christophe Balissat sounds considerably closer. Perhaps because of that he adopts a much more intimate, conversational style than do either of his rivals. Of these Jean Desailly (for Dutoit) is easily the most dramatic and ‘public’ in his style. Daniel Mesguich (Baudo) is closer in style to Desailly than to Balissat. I think Balissat’s contribution is excellent but there are times when I’d have liked him to “let go” a bit more. The main issue for me, though – which may not apply to other listeners – is that I find it almost impossible to place his contributions in the acoustic context of the performance as a whole. I don’t get the sense that he’s speaking in the same acoustic as the other performers – I may be wrong, of course – and his narration, for all its excellence, sounds rather studio-bound. On the other hand, his relatively restrained style suits the intimate nature of the performance as a whole. Reuss is well served by his soloists. Marianne Beate Kielland has a fine, warm tone. Incidentally, Reuss allots to her the ‘Song of David the Shepherd’ near the start and she does it very well indeed. Dutoit, I think, gets it wrong in using a boy treble for that solo; his singing might pass muster in a live performance but I’m not sure it’s right for repeated listening. Soprano Lucie Chartin is consistently good and though Thomas Walker is not French his tenor solos sound suitably French in timbre. Athéna Poullos is appropriately graphic in her Witch of Endor narration. The contribution of the choir is superb. The singing is consistently incisive but these singers are just as successful in the rapturous closing chorus. The instrumental ensemble offers excellent playing throughout. I think the way Daniel Reuss conducts the music is first class in every respect. Where the music is punchy and vivid, calling for precise rhythmic articulation, Reuss ensures his performers deliver. He’s no less adept at conveying the episodes in which Honegger is in lyrical vein. This is a marvellous, inventive score and I found Daniel Reuss a thoroughly convincing exponent of it. With the slight caveat about the way in which the narrator has been recorded – and this may not bother other listeners – this is a recording and performance that do full justice to Honegger’s highly original and very communicative score. I enjoyed it very much. The accompanying documentation is excellent.